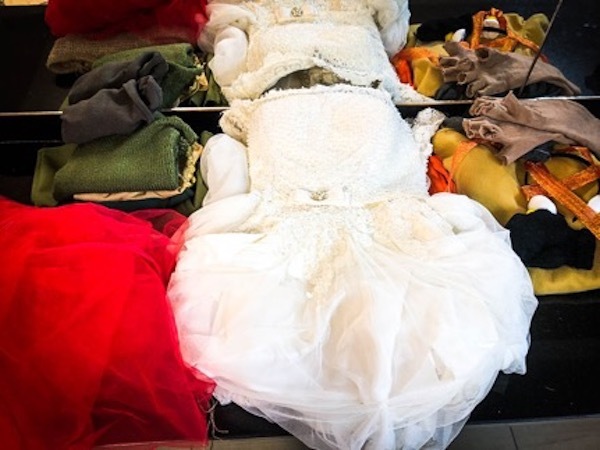 Costumes and props stored backstage in the dressing room during the tech rehearsal for ASHTAR Theatre’s Peer Gynt at the Ramallah Municipality Theatre in July, 2018. Photo: Ashley Marinaccio. 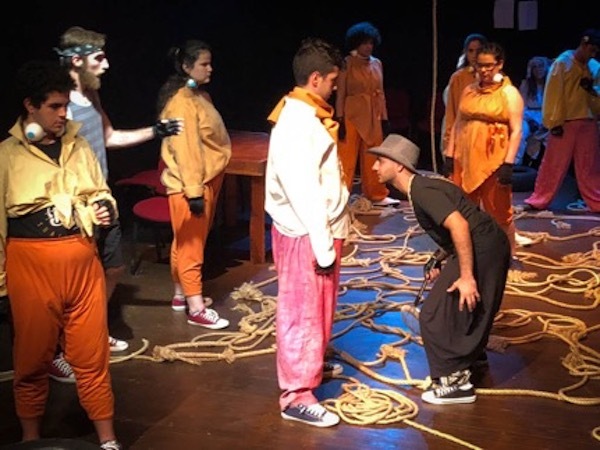 Ibsen’s 19th century Norwegian play Peer Gynt has been reimagined in a new light thanks to the youth of Palestine at the ASHTAR Theatre who debuted a new adaptation of the classic fairy tale in the 2018 ASHTAR Youth International Theatre Festival this past July. The students of ASHTAR put their own spin on Peer Gynt, placing him in the same fantasy as the original text but adding contemporary dance, movement and music that makes their production uniquely Palestinian. Located near the city center of Ramallah in central Palestine, ASHTAR Theatre was founded by Iman Aoun and Edward Muallem in 1991 and is a five-year educational program and theatre school for young actors with rigorous training in acting techniques, physical theatre and Theatre of the Oppressed. Aoun says, “In 1991 we created the first theatre school in Palestine. 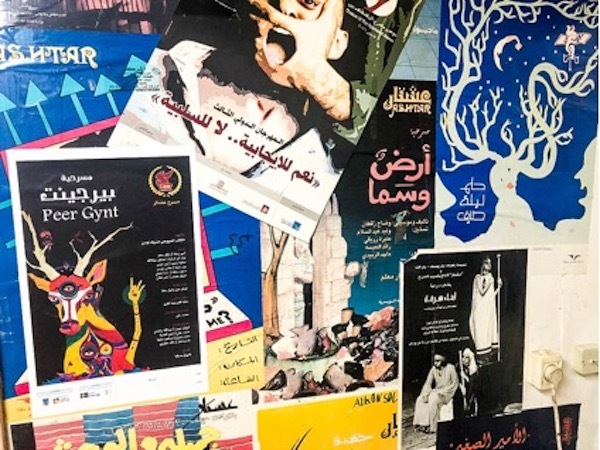 There were companies doing some workshops but we wanted to offer training and education to the young people in Palestine.” The theatre’s history is proudly displayed in the hundreds of posters and photographs that collage the walls of ASHTAR’s hallways and offices. The new Peer Gynt poster joins the other images that highlight the 27 year history of the ASHTAR Festival. Photo: Ashley Marinaccio. Rehearsal for Peer Gynt at the ASHTAR Theatre. Students rehearsed up to 36 hours per week for the production which debuted in July, 2018 as part of the ASHTAR International Youth Theatre Festival. Photo: Ashley Marinaccio. Over their five years of training, ASHTAR students gain a respect for the craft of acting in addition to understanding the inner workings of theatre production and how to make a show. Peer Gynt is the final performance of the 2018 graduating class, many of whom will continue their theatre education in college. 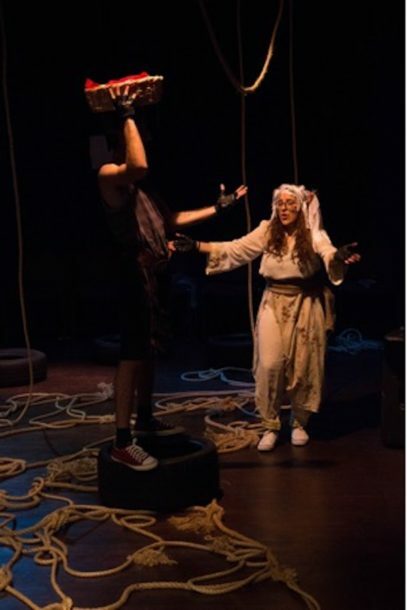 “One of the reasons why ASHTAR represents such an important performing arts institution in Palestine is because it truly raises its students with the highest standards and ethics of theatre and theatrical education,” says Kapustina. “Despite their young age, the devotion and hard work of the students to the production was incredible. Their schedule was rough. In June and July, they had rehearsals 6 days a week from 11 am to 5 pm, which is the same schedule as ‘grown-up’ actors. In addition to being at the theatre all the time, the students willingly helped with scenography work, building and prop design.” Theatre programming plays critical roles in not only offering outlets for creative expression and theatre training, but a space for Palestinian youth to directly engage in community building as a means of creative resistance. Theatres are challenging the high statistics of youth unemployment in Palestine by providing job and skills trainings in addition to employing graduates of their programs. Saba is a 2012 graduate of the ASHTAR youth theatre program. He began studying theatre at age 10 and continued his studies at Birzeit University, eventually receiving his MFA from the University of Connecticut. Upon graduation, he returned to Palestine where he now works as a director and actor. “There is a great amount of passion, professionalism and thirst for theatre; and a strong sense of commitment and locality to the global and the local community,” Saba comments. Isleen Atallah in the role of Asia in ASHTAR’s production of Peer Gynt. Photo: Ashley Marinaccio. Isleen Atlallah, age 16 who played the role of Asia, Peer Gynt’s mother, confides, “I was having a bunch of problems in my personal life and because of that was having problems getting through and finding the character. It should have been an easy character but I didn’t think I was giving her justice until the last week (of rehearsal) when I told myself ‘You are here. You are this character. Give her justice.” Atlallah’s performance is one of the many standouts in the show. Her acting craft and movement ability are mature far beyond her years. She has a commanding presence on and off the stage. “I wasn’t always this confident,” she says. “I used to be very shy. Theatre was a huge turning point in my life. I gained confidence and friends. My bestest friends are from theatre.” She is planning to continue studying theatre and science in college. Ameer Zabaneh in the title role of Peer Gynt, performing at the Ramallah Municipal Theatre during the ASHTAR International Youth Theatre Festival in July, 2018. Photo: Ashley Marinaccio. “In many cases, it’s important for people to know Palestinian theatre exists,” says Melkar Muallem, who dazzles audiences in the role of the button maker. Muallem has a commanding stage presence. He embodies his character impeccably in his voice and physicality. “I think a lot of people have the wrong understanding of Palestinian culture and don’t realize how rich is it. We really care about telling our own story as well as improving our own community. Theatre is a peaceful means of both demonstration against the occupation as well as our own internal corruption.” Muallem, who started his acting career at age 8 in the first Palestinian musical, has worked professionally in theatre and film. Despite a robust performing arts community, which includes classics, adaptations, newly devised work, music and dance performances, Saba says, “a lot of people said they had never seen anything like Peer Gynt before, especially in Ramallah. They see the potential in the kids and were really encouraging them. I feel that the audience appreciated the work and the passion behind the play. They left (the theatre) introduced to new concepts, a new story and ideas. We had people apply to be part of the ASHTAR school after seeing the play,” explains Saba. Émile Saba (left) and the cast of Peer Gynt during a rehearsal for the show at the ASHTAR Theatre in Ramallah, Palestine. Photo: Ashley Marinaccio. While on clear days the sea is visible from the hills of Ramallah, due to the Israeli occupation, many of the youth are forbidden from swimming in the sea or visiting the beach. Saba says, “In Peer Gynt, there is a lot of talk about water and the ocean and it helps the students imagine because a lot of elements of water are missing in our daily life. A lot of our youth have never been to the sea before. It helps the youth to talk about it and to see it on stage. This fantasy element is important because our lives are very ingrained in reality and concrete grey blocks and seeing something that encourages you to think, and to imagine and to travel with your mind is very healthy and important.” Peer Gynt has provided the youth with a platform to imagine alternatives to life under occupation and futures that involve artistic production and theatre making. “Art can be a very strong tool of revolt and fighting back against oppression but also art can be separate from that. Political art doesn’t need to be direct as a poem about the occupation or a painting of the colors of the flag. When you break people’s expectations and smack them in the face with something new, that’s when you start making change,” says Zabaneh. 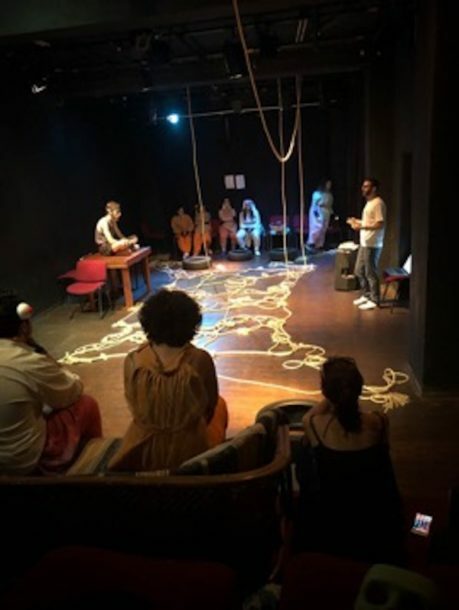 Through the Peer Gynt process, students have discovered that retellings of traditional stories and reimagining classics can speak to audiences about the Palestinian experience as much as documentary theatre type storytelling does. But moreover, the training they received at ASHTAR theatre and the grueling rehearsal process has instilled confidence, work ethic, a strong sense of identity and communication skills in all of the participants, which they will carry with them throughout their lives. Ashley Marinaccio is a theatre artist and scholar who creates work to challenge the status quo. She is dedicated to documenting the socio-political issues that define our times. As a director and playwright, her work has been seen off-Broadway, at the White House, United Nations, TED conferences across the United States, Europe, and Asia. Currently, Ash is working on her Ph.D. in the Department of Theatre and Performance at the CUNY Graduate Center, where she is focusing on theatre and war. Ash is the founding Artistic Director of the theatre company and United Nations NGO Girl Be Heard, where she received numerous accolades, including LPTW’s Lucille Lortel Women’s Visionary Award. She is a co-founder/director of Co-Op Theatre East, member of the Civilians Field Research Team, and creator of the B.F.A. In…, a new web series. Ash is on the faculty at Pace University and Hunter College. Learn more: ashley-marinaccio.com.